You have just broken through the fog and confusion and realize that he is abusive and it is not your fault. The question looms. Should you leave or should you stay? There is so much to consider when deciding what to do about an abusive relationship. Your entire life balances on this choice. Everything about your life will change if you go. And, conversely, everything about your life will probably stay the same if you stay but which one is acceptable and which one is best? Only you can choose and no matter what you choose you will have good reasons for that choice. Some will choose to stay for many reasons. You may have concerns about where you would go, where you would live and how you make money. One of the first things an abuser will do is isolate a victim from her family and friends. They will often move her away, refuse to allow her to see them or even ruin relationships so that she has nobody to turn to. A lot of victims have been forced to stay out of the work place and have no access to money. You may have hope that he will change. Most victims live in denial about the abuse they are experiencing, at least for a time. It is very difficult to accept that you cannot change an abusive partner and there is nothing you can do better to make it stop. Choosing to leave means that you have given up hope to repair your marriage and that is terrifying. You may feel pressures from your family to make your marriage work. Your church teaches that “God hates divorce” without fully explaining what that means. Cultural and spiritual pressures are a major reason why women cannot and do not leave abusive relationships. Often, people on the outside of the relationship are lead to believe that the abuser is an amazing, charming, smart and kind person because of their public persona. This again, isolates a victim and makes it impossible to turn to her church family. Add the message that ‘God hates divorce’ period, with no options for divorce unless he seriously physically abuses you or has an affair, and a victim is left hopeless spiritually as well. She could get safe, leave her relationship and lose her place in heaven as well. This is often, too much of a risk. Maybe, you are concerned about leaving your kids without the other parent active in their lives. Many people believe strongly that every child deserves to live with their other parent and do not consider the effects of living with an abuser. Statistics and stories show us that children who are exposed to domestic abuse have a whole long list of life long issues physical health problems, mental health issues, substance abuse problems and emotional issues including a higher rate of becoming a victim or an abuser themselves. (1*) Almost always, children are healthier not living with an abusive parent then they would be otherwise. On the other hand, you may realize that there will be a huge custody battle and fight for you to keep your children safe. Legal battles cost a lot of money. They cost a lot of emotional expense. They are scary and our family courts have a long standing history of not protecting children very well. 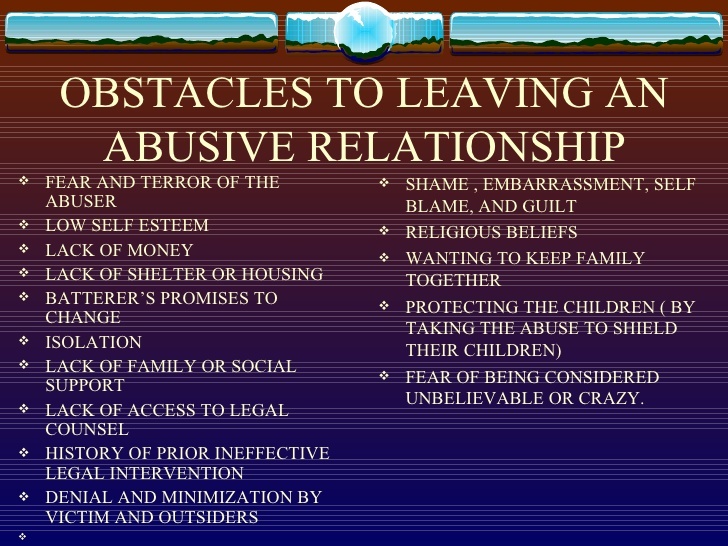 If you leave, you might lose the children and they could be harmed by the abuser as a way to hurt you. Letting go of the dream of a happy and successful marriage is heart breaking. The abuser, the church and society often tell you that you should do everything in your power to make the marriage work and that by choosing to leave you are giving up. These messages and lack of support take an emotional toll and is often too much for you to handle. Victims usually want the violence, not the relationship, to end and will often take steps to try to stop the violence before resorting to having to leave. Hope is paralyzing. When you still have hope of making the marriage healthy, it will be close to impossible to leave. Some of you will choose to leave their abusers. It is vital that you, if you choose to leave, have a support system that will uphold you and stand with you. 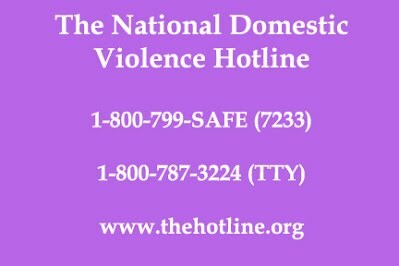 A support system can be friends, family or even developed through reaching out to a counselor, shelter or by calling the domestic violence hotline. You are more likely to be able to get out and stay out safely, if you have a safety plan. A plan for leaving, for staying safe after leaving and for starting over can be developed by the help of an abuse counselor or the safety hotline. If you can get hooked up with resources like WIC (women, infants and children), welfare, housing, emergency shelter etc. you will be more likely to succeed in setting up your new life. Counseling, a healing program, reading and educating yourself on what you’ve lived through will help you in your healing and recovery. Education and support will help you to thrive in your new life as well as recognize and choose to stay out of abusive relationships. There are many reasons why women stay and why women choose to leave a relationship that is abusive. I have only touched on a few of the biggest reasons on this blog. Support and resources are two of the most important factors in a woman being able to get out safely and stay out permanently. What other reasons kept you in the relationship longer or empowered your decision to leave? I stayed longer because I went back once already, I was afraid of judgment from others, afraid I was seeing into things, making it a bigger deal than it was. I was afraid I was the failure, that there was something wrong with me. Reblogged this on Sing Out Loud and Strong. Reblogged this on Robin Luftig. Abuse is a disease in churches today. Many people still don’t know how to deal with it. Thank you for shedding light on an epidemic that has a stronghold on many families. YES! I agree! It is an epidemic and I am so glad to be a small part in educating others regarding it. God does no intend that ANY Of his children live in danger physically or mentally! Stay tuned to my announcement about a nonprofit I am opening on this exact issue!! I’d love to stay in touch. Are you on Social media? I’d love to drop you a private note. This is such a difficult situation for people to navigate. Abuse comes in so many forms, some so subtle that you do not realize until years later that it was happening for a long time. I am so grateful for organizations that are there to help women who need to leave those situations.